Start reading Calm the F*ck Down on your Kindle in under a minute. "Practical, not at all preachy, this book will take you from break-up to car breakdowns, and keep you calm all along the way. 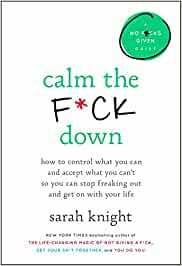 "―Irish Examiner, "Top 100"
"If you like your self-help books to be no-nonsense then you'll love the work of Sarah Knight... a practical way to tackle overwhelming situations with no BS. "―Woman's Way, "Book of the Week"
It seems to me that this author just needed to fill up pages to meet the requirements of her book contract. There is not one bit of useful info in this book. I kept thinking that I should write a book if this is all it takes. Way too much "humor" and not one nugget of wisdom in it. Do not waste your time or money with this rambling little book of no value. I don't know that I have ever returned a book before but this is either going back or going in the garbage because I wouldn't want anyone else to waste their time on it. I really enjoyed Knight’s first book, and her follow-ups were ok. But I didn’t get anything out of this one. I like her sarcastic humor but it felt overdone in Calm the F*uck Down, and I basically skimmed the last half. Disappointing. 5.0 out of 5 starsHumorous and helpful! Whether a problem is big or small, whether or not it has a solution, worrying is not going to fix anything. While this book might not tell you anything you don't know, it delivers the message with humor and kindness (and, yes, snark as well) that might make it stick this time. I also appreciated that it acknowledges not all worry is created equally, we each react to the world around us in some ways that are unique to ourselves, and perhaps most importantly that some kinds of anxiety are best treated medically (and that's okay!). 1.0 out of 5 starsPolitics? Really? I'm on page 7 and already, "While every day, some of us are hoping someone else gets arrested for treason!" WHY DOES EVERY SINGLE THING HAVE TO INVOLVE POLITICS? I don't even want to finish reading at this point and will likely return. Holy jeez. Again on page 9 about an ingrown toenail in a red hat being elected. I didn't even vote for the guy. I'm so sick of having it shoved in my face 24/7. I don't understand how Ms. Knight is a best-selling author. I just don't get it. Some millennials and younger probably like it. 5.0 out of 5 starsAnother great read, apply tactics immediately! I always love Sarah’s practical advice and the way she delivers it. I find her books to be some of the the most logical (I loved the logicats!) and find my self applying her no nonsense tactics daily. I recommend all four of her books. And she’s funny as hell! Thanks Sarah, I needed this!